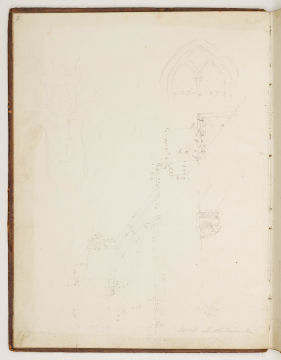 It is impossible to identify to specific buttress shown in this drawing, though it records the severely decayed condition of the buttress pinnacles by the early Nineteenth Century. The details include a demi-grotesque corbel on the underside of the buttress arch and the upper part of a two-centred biforate window. The latter bears a close resemblance to the external appearance of the thirteenth-century windows in the east wall of the Painted Chamber. There is also a detail sketch of foliage, perhaps related to the latter.